In 2017 Gourmet Exhibition announced yet another innovative activity! 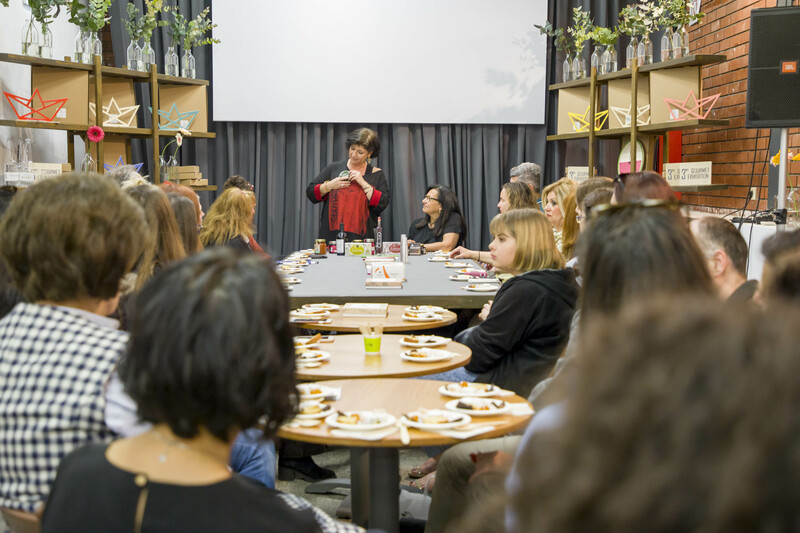 Thematic product tastings in the form of MasterClasses were introduced with striking success and enthousiasm. Well known connoisseurs led the tastings in five distinct areas of interest to buyers and food journalists. Eleni Psychouli, the hostess of the 3rd Gourmet Exhibition is inviting you to join her in the vegan product tasting. She will treat you to all kinds of traditional and modern products, will explain their process and will help you discover their history! To book your place, send a message to send a message to events@gourmetexhibition.com writing the event you wish to attend in the subject and your name in the body of your email. Malama Banavou and Alexandros Alexandrou are your hosts. Be ready for a real treat, tasting cheeses with herbs and olive oil, legume salad with kavourmas, ‘Afkos’ (local fava dish) with seafood marinara, Lemnos panacota (desert), accompanied T oy Lemnos rusks and local wine! To book your place send a message to events@gourmetexhibition.com writing the event you wish to attend in the subject and your name in the body of your email. An interactive tasting with sweet delicacies from the every cornet of Greece. Gastronomy journalist, Ioanna Stamoulou chooses popular traditional sweets from every part of Greece and builds an event that you should not miss! Aren’t you intrigued? To book your seat, send a message to events@gourmetexhibition.com writing the event you wish to attend in the subject and your name in the body of your email. Culinary columnist and wine sommelier Ms. Alexandra Anthidou will be your host and guide through a tasting of foods and wines of the Thessaloniki area. Products from Thessalonian exhibitors, the Thessaloniki Food Festival and local wineries members of the ‘Wine Roads of Northern Greece’ Association! Chef Ambassadors Michael Adamidis, Vangelis Asimakopoulos and Yannis Hatziparasidis of the ‘9th Thessaloniki Food Festival’ will be preparing delicacies using our exhibitors’ products while Ms Anthidou will be paring them with wines and tsipouro.